If you have decided to get an iRobot Roomba vacuuming robot so you may never have to manually vacuum your home again, and you don't want to pay the higher prices of the 900 series Roomba robots, you might want to consider Roomba 890 or Roomba 650. Though Roomba 650 will not offer you all the features Roomba 890 comes with, it still comes with enough must-have features, such as good floor coverage, auto-recharge, and scheduling, that make it quite acceptable for most homes. As a matter of fact, Roomba 650 was at the time of this writing one of the most popular Roomba robots sold. In this article, we will compare Roomba 890 with Roomba 650, so you may know exactly if the features that come with Roomba 650 are sufficient to clean effectively your home, or whether it would be better for you to get a Roomba 890. This article will compare the Roomba 890 and 650 robots. 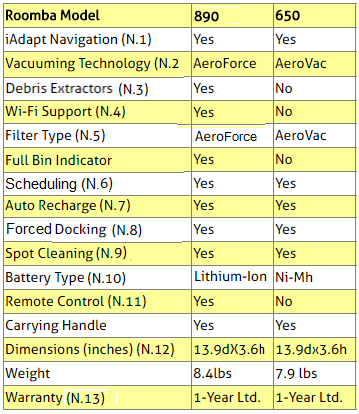 The following table compares the iRobot Roomba 890 and 650 robots. The iAdapt responsive cleaning technology composed of sophisticated software and sensors allows Roomba robots to clean more thoroughly the room, making multiple passes, avoiding stairs, getting under and around furniture, and cleaning along wall edges and corners. The low profile design of these robots allows cleaning under most furniture. They also automatically adjust to all floor types - carpet, tile, hardwood, laminate and more. Roomba 650 is equipped with acoustic sensors which allow them to find dirtier areas and spend more time cleaning them. Virtual Walls are tiny devices that emit an infra-red beam that the Roomba will not cross. It is used to stop the Roomba from entering areas not wanted to be cleaned. It can be set to block an area ranging from three to eight feet long. 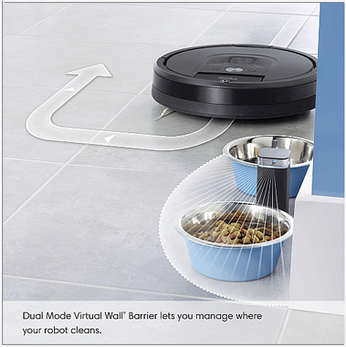 Dual Mode Virtual Wall Barriers, like Virtual Walls, can be used to block off an open doorway, but they can also be used as Virtual Wall Halos to protect some restricted area within the room, such as the area you where your dogs food is placed..
Counter-rotating dual multi-surface brushes (on Roomba 650) or counter-rotating dual multi-surface tangle-free brushes (on Roomba 890) pick up dust, debris, dirt, pet hair from the floor. Note that the tangle-free brushes are also called debris extractors. AeroVac technology found in Roomba 650 uses dual counter-rotating brushes and allows for optimized airflow that pulls hair off the brushes and sends it into the bin. This allows the bin to fill more evenly requiring less frequent emptying of the bin. AeroForce technology found in Roomba 890 introduces the dual tangle-free brushes (debris extractors) and delivers an ideal balance of vacuum suction and debris extraction: These tangle free extractors grab and break down debris eliminating hair tangles and jams, and an airflow accelerator creates a sealed channel that concentrates the airflow, sucking in more debris. Thanks to the high efficiency vacuum, the air power is increased 5 times in Roomba 890 compared to Roomba 650. The tangle-free brushes (also known as debris extractors) ​ found on Roomba 890 grab and break down debris, eliminating hair tangles and jams, and an airflow accelerator creates a sealed channel that concentrates airflow, sucking in more debris. When Roomba 890 is connected via Wi-Fi to your smartphone, you can use the iRobot Home App for Android and iOS to invoke remotely operations (such as cleaning, scheduling, etc.). ​Note that Roomba 890 is compatible with Amazon Alexa. Simply ask Alexa to start, stop, or dock your robot​. The AeroVac filter found in Roomba 650 handles quite adequately hair, pet fur, lint and carpet fuzz, but not as well as AeroForce High Efficency filters do. Roomba 650 has a Nickel Metal Hydride (Ni-MH) battery, while Roomba 890 has a Lithium-Ion battery. Roomba 890 can be remotely controlled from your smartphone or tablet using the iRobot Home App. No explicit remote-control device is provided. Roomba 650 can not be controlled from your smartphone and does not come with a remote-control device. But, if desired, an optionl remote-control device can be separately purchased (see below Amazon products section). Note that Roomba 890 is also compatible with Amazon Alexa, including Amazon Echo, Echo Dot and Amazon Tap. It's built with the AeroForce vacuuming technology with debris extractor which is more powerful than the AeroVac technology used by Roomba 650. It has a more efficient filter. It is equipped with a full bin indicator. It uses a Lithium-Ion battery which is designed to provide longer cleaning sessions and last longer than Ni-Mh batteries before needing to be replaced. ​Though the above listed Roomba 890 additional features can be quite useful in certain situations, unless you wish to use your smartphone to control the robot, you would probably be more than satisfied with the vacuuming results obtained with Roomba 650 which comes with all the must-have features such as good floor coverage, auto-docking, self-charging and scheduling. More recently Roomba 652, which is almost identical to Roomba 650, was made available. Roomba 650 carries an Ni-Mh battery while Roomba 652 carries a Lithium-Ion battery. 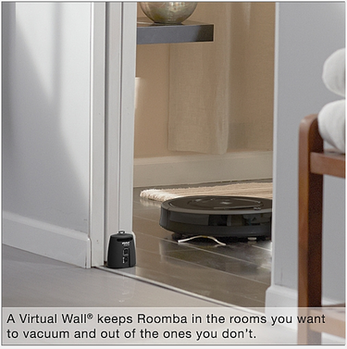 Also no Virtual Wall device is included with Roomba 652. Otherwise, the two robots are identical. Note that, if needed, a Virtual Wall device can be optionally purchased (see below ).